Marvin was making his dad a cup of coffee on the weekend. He had to be very careful because the water was ‘boiling hot’ and if he spilt even just a little bit on him, then he would burn himself very badly. I was very proud of Marvin because he did everything very safely and he even remembered to make sure that the cord was not hanging own the side of the cupboard, so that no one could accidentally get hurt by pulling on the cord. 1) What does an elf do when he gets home from school? 2) What do bees do with their honey? 3) What kind of insect loves God? 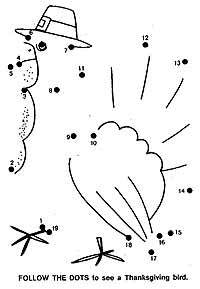 4) What can you break without touching it? It seemed like children had their say last weekend when Central Airport Plaza launched the “Central Aquarium Kids Club” for children aged 3-12 years. The huge aquarium was the center of attention when the divers went in to feed the fish. 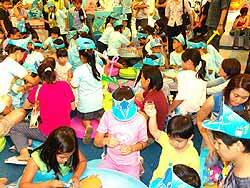 The kids club was opened to help parents shop “in peace” while their children are entertained and educated about everything there is to know about the wonderful world underwater. Children had a great time - instead of being bored shopping with Mum (are we there yet, no, are we there yet, no, are we there yet, no...), they had something to do according to their own age! 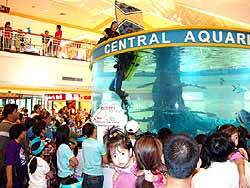 The grand opening of the “Central Aquarium Kids Club” was on April 25 on the ground floor of the Central Airport Plaza. Children and parents seemed to be drawn to the area by a magnet. There was hardly any space to walk, sit or watch. Five lovely mascots, a monstrous Balloon Fish, Squidy, Sharky, Enny Mony and a sweet pretty Sea Star were there and are part of the club, to entertain and play with the children. They certainly had a fun time and it was nice to watch how well the helpers took care of them. If your child would like to become a member, stop at the public relations counter on the 1st floor of Central Airport Plaza and apply in person. 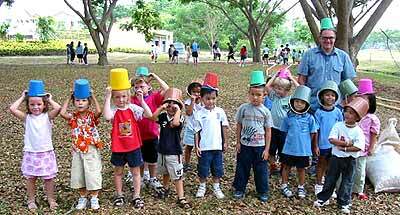 The yearly fee is 200 baht per child, but will only cost 120 baht if you apply before May 31. The club is open every weekend from noon until 7 p.m., which gives parents enough time to shop and gives their youngsters a worthwhile time as well. I saw in your newspaper which my mummy reads that you want to know what other children were doing on Songkran. I still have holidays and it is so hot outside. That is why I write to you. 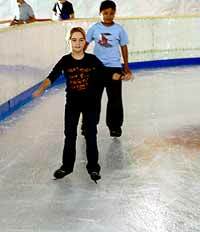 This is me ice-skating! I wish we could have an ice rink here also! It was only the second time that my mum and I had been to Chiang Mai. We had almost forgotten that it would be Songkran in two days. We stayed at an apartment that was right on the moat! We visited good friends and had dinner almost every night with them. When Songkran started we went to their office to hide. I couldn’t believe my eyes. Everybody was so crazy and the safest way to get somewhere was by car. The craziest thing they did was spraying with a big hose like the fire brigade always does. The thing that I didn’t like was that if suddenly a load of water came from anywhere and I didn’t see it coming when it hit the car, I got a little shocked. We were lucky, we didn’t get soaked this time. I loved Thursday because I went ice-skating for the first time in my life. I never thought that the first time I’d go on ice would be in Thailand. I am a foreigner but grew up in Asia, by the way. When I got back home (Pattaya), the Thai New Year and the water battle had just started here. I also send you a photo of me ice-skating. That was so cool! If you want to understand why dogs behave the way they do and what’s going on in their minds, you need to know the origin of the dog. First, all dogs are carnivores, mammals feeding mainly on raw meat and bones. They are members of the Canine family, or Canidae, that includes wolves, jackals, foxes, coyotes, dholes and African wild dogs. Comparisons between the anatomy, especially the skulls, of domestic dogs and other canine species have excluded as possible ancestors all but the coyote, wolf and jackal species, belonging to the “Canis” genus. Before, some scientists even believed an ancient wild dog species as a possible ancestor, but no fossils have ever been found to support this theory. In captivity all Canis species interbreed with dogs and produce vital and fertile offspring. In the wild, coyotes interbreed with dogs too, and so do wolves. However, due to geographical reasons coyotes cannot be seen as the ancestor of our domestic dog. And wolves only interbreed when there are just a few of them left in the area; otherwise, dogs will immediately be eliminated by the pack as intruders into the territory. Jackals, on the other hand, can live together amicably with (paria) dogs in the same area, but no wild mixed offspring has ever been recorded. Further studies have shown more differences between jackals and dogs, while wolves and dogs are very much alike in almost all respects. So it is that the dental arrangement of the dog’s teeth is different from that of the jackal but similar to that of the wolf. Comparable serum research has shown a clear similarity between wolves and dogs and their mixed offspring, while differences are found in coyotes, jackals and foxes. And it has been discovered that wolves and dogs have the same number of chromosomes - 78 - while jackals have 74. Of the ninety behavioral patterns researched in the dog, 71 percent are present in the wolf. Also their vocal patterns and social behavior are similar, while the jackal’s pattern and behavior are distinctively different. Based on these many anatomical and behavioral studies conducted in the past few decades, the almost inescapable conclusion now can be made that the species dog, Canis familiaris, descends from the species wolf, Canis lupus. On Thursday, April 22 Prem hosted a school-wide Earth Day celebration to remember. Students of all ages, from the twelfth grade down through the kindergarten, could be seen bird watching, testing water quality and building a nature trail around the school using natural materials. All of the participants had smiles on their faces as they devoted the day to learning about and working to solve some of the most serious issues facing the planet. 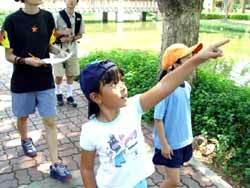 Lucy (gr.2), points out a bird to her friends during a bird watching session. Students were divided into four work groups, appropriately named “Earth”, “Air”, “Fire” and “Water”. During the morning sessions, the groups moved between four different stations. At one station students learned about water quality and water purification. At the second station they learned about bird life at Prem and went bird watching around campus. At the third station they learned about alternative energy sources, and at the fourth station students worked on the construction of a wall-sized Earth Day mural made out of recycled felt. 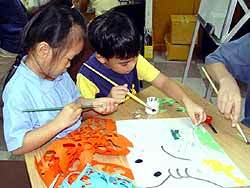 Kindergarteners Mary and Charlie work on an Earth Day mural to decorate the school. The afternoon was devoted to more long-term projects. The “Water” group tested the water quality at Prem in order to find ways to improve the water quality on campus. The “Earth” group had a lot of fun building a nature trail around campus using bamboo and coconut husks. The “Air” group did research about energy production and energy needs, while the “Fire” group spent the afternoon in the Art House using their creativity to transform throwaway materials into beautiful art. 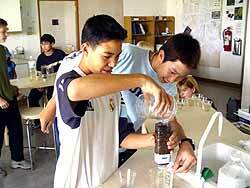 James (Gr.7) and Aut (Gr.9) work together to construct water filters. Earth Day at Prem proved to be a huge success and everyone had fun collaborating on various projects. It was certainly one day when Prem’s school motto of “Global Citizenship” shone through. Both Prem students and teachers took time to reflect on their place within a larger, global community and to discover ways in which we can all live more environmentally responsible lives. 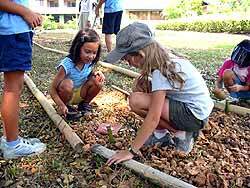 Soho (Gr.1/2) and Jeanelle (Gr.1/2) work on building a nature trail around the Prem campus using bamboo and coconut husks. 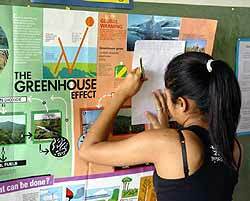 Prem student Som learns all about the Greenhouse Effect. Junior school students above have a little fun after working hard at building a nature trail around the Prem campus. The students in the GIS production are under the musical direction of Connie Eckerle and theatrical direction of Renee Weygandt. 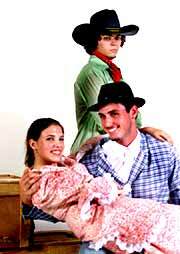 “Oklahoma!” will be performed from May 27-29 at 7 p.m. in the GIS multipurpose room. The love triangle, Ado-Annie (Mykal Inglis - Grade 10), Ali Hakim (Drew Persons), and Will Parker (Zakk Hallead). The musical takes place in the Indian Territory that eventually becomes the American state of Oklahoma, a land cherished by both cowboys and farmers alike. 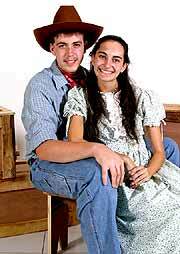 As they learn to share the land, romance blossoms between main characters Laurey and Curly, played by senior Kara Scheuerman and junior Shawn Murry. Aunt Eller’s (Jessica Johnson) hired man, Jud Fry (Matt Kramm), also vies for Laurey’s attention. A love triangle develops between the flirtatious Ado-Annie (Mykal Inglis), the charming Will Parker (Zakk Hallead), and the Persian peddler Ali Hakim (Drew Persons). Curly (Shawn Murry - Grade 11) and Laurey (Kara Scheuerman - Grade 12). “Oklahoma!” first appeared on stage in 1943, and continues to be a hit on Broadway. It was written and composed by Richard Rodgers and Oscar Hammerstein who wrote numerous well-loved musicals such as “The Sound of Music”, “South Pacific” and “Carousel”. The triumphant closing song, “Oklahoma!” is a well-loved tune and became the state song. Rehearsals are currently underway with students and directors putting in many hours to make this a production to remember. Seating is limited, so tickets should be purchased ahead of time for 200 baht. For ticket information call 09-631-7023 after 4 p.m. Don’t miss out on the chance to experience it!